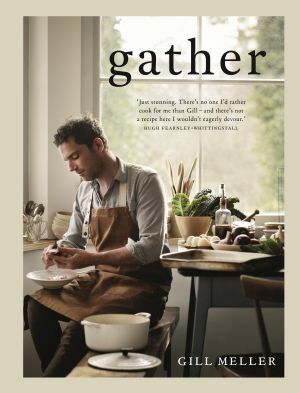 gather is a new cookbook that celebrates simplicity and nature, both in ingredients and cooking styles. Head Chef at River Cottage for 10 years, Gill Meller showcases 120 brand new recipes inspired by the landscapes in which he lives and works. With great food at its heart, gather is the most contemporary of cookbooks, with photography that captures a year of the best cooking and eating. You can get the book at a special offer price with free delivery (RRP £25.00) from our friends at The Book Depository. We are delighted that our truffles appear in one of Gill's recipes and are able to reproduce the recipe here. Thanks to Gill for permission for the recipe and images. This dish contains some of my favourite ingredients: crispy, salty chicken skin; young, tender, buttery sweet leek, with its silk-on-the-teeth texture; intense, creamy and comforting pinhead oatmeal, cooked a little like risotto rice and rich like the best bread sauce; and, if you can find them, English summer truffles, with their subtle, earthy aroma. (A scant trickle of good truffle oil would be good as well.) In truth, this is a simple and a rather humble plate of food. Heat the oven to 180°C/350°F/gas mark 4. Place the oatmeal in a bowl and cover with water. Set aside to soak while you crisp up the chicken skin. Line a large roasting tray with baking parchment and lay over your chicken skins, neatly and evenly spaced. Season with salt and pepper, then place in the oven for 15–20 minutes (or a bit longer if necessary), until crisp. Remove the skins to a rack to cool. Pour 1 tablespoon of the fat from the tray into a medium heavy based pan. Place the pan over a medium heat and add the shallot or onion, garlic, bay leaf and thyme leaves. Cook, stirring regularly, for 3–5 minutes, until the shallot is soft but not coloured. Drain the softened oatmeal through a sieve and add it to the pan. Stir well, then pour in the cider (if using) and bring to a simmer over a medium–low heat. Pour in half the stock, then allow the mixture to simmer, stirring regularly, until the stock is nearly all absorbed. Add the remaining stock and stir well. Cook for about 15–20 minutes, until you have a relatively loose porridge and the oatmeal has lost its nutty bite. Remove from the heat and stir in the cheese and 1 knob of butter, allowing them to melt into the mixture, then season well to taste and set aside. Place the remaining butter and 100ml (3½fl oz) water in a large heavy-based pan. Lay the leeks in the pan, season well and place a lid on top. Cook for 10–15 minutes, or until tender. To serve, warm the oatmeal through (you may need to loosen it with a little extra hot stock), then divide it equally between two plates. 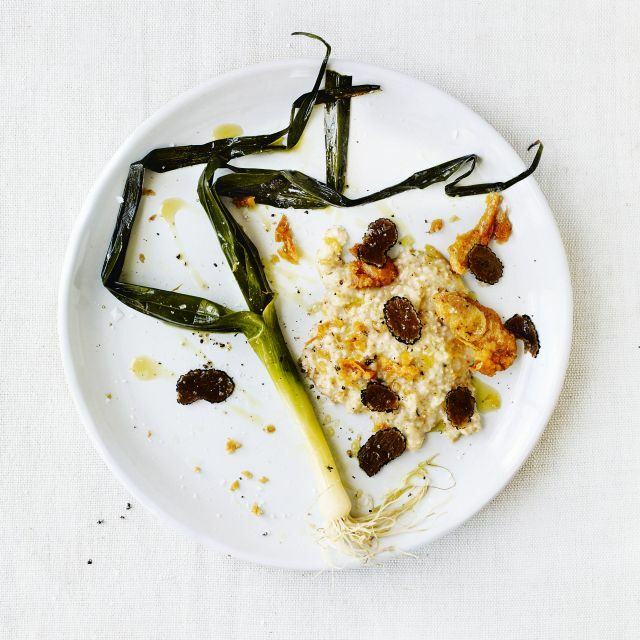 Place a warm leek on each plate along with some shards of crisp chicken skin and a few shavings of truffle, if using. Serve straight away.